For a modern-day marketer, staying ahead of the curve and coming up with innovative ideas is inevitable. Engaging the customer with the right content at the perfect time and through their preferred channel of communication has become more important today than ever. As marketers got closer to the users with an App, not only marketing opportunities increased but the need to impress became greater. In this rat race, push notifications came swooping in giving marketers a personalized and highly versatile way to get their user’s attention. While some have over-exhausted this powerful marketing channel without yielding expected results, some are yet to explore its full potential. If you are also still looking to solve this mystery called Push Notification, we are here with a detailed guide to understanding every aspect of it and how to make it work in your favor. Let’s get started! To start off, every App publisher needs to register with different Operating system notification service (OSPNS). The OS service provides the App publisher with Application Programming Interface (API). This API becomes a medium for the App to communicate with the OS service. In order to trigger a push to the user’s device, the API call is made at the backend through the GCM. An App published then adds a Software Development Kit (SDK) to the app, which is a code library specific to the OS notification service. This allows App publishers to back their pushes with powerful analytics and segmentation. Finally, the user downloads the App from App store to their device. Once they provide permission or opt-in to receive the notification, it appears on their screens. As marketing has evolved overtime, the approach of pushing a product to a customer changed into creating what they need or want. Although in this era of AI, it has moved beyond just supply and demand. This is the time where marketers are expected to know their customers and predict their needs in advance along with presenting offerings relevant to them. Mobile Apps have been one such development that is closer to a user than any other platform. Staying closer to them, they are able to serve users firsthand for various needs. There is major competition in the app market. Every week there’s something new in the market offering something useful or unique to the users. As much as there is an instant attraction for a new App, their users are equally erratic. A market where there is so much competition, marketers cannot afford to go easy with their marketing efforts. Precisely why push notifications are so valuable in the whole process! Unlike in-app messaging or an SMS, App pushes carry the power of reaching any particular user at their optimum time of influence, communicating only relevant messaging in the most precise and action-oriented manner. Push notifications are a great way to keep users engaged, derive feedback from them, send them time-sensitive information and alerts, notify them about crucial events/updates and so on. They don’t meet the fate of lying in the message folder, waiting patiently for the user to open and have a read. They are also above and beyond the restrictions of SMS messaging as the wide variety of push notifications come handy in communicating various kinds of information for different industries. This is the most basic type of push notification that marketers can use to talk business. A crisp & to-the-point text message covers the most crucial information that may or may not be sale-oriented in nature. These types of pushes are most effective to share information with users that require their immediate attention. However, marketers can also utilize this ‘no-nonsense’ medium to convey some amazing deals and discounts focusing only on the information and getting the user temped at a single glance. Justifying the expression, “a picture is worth a thousand words,” an image-based push notification is able to communicate it’s message boldly and effectively. This notification is highly relevant for brands that need to play the visual card to make their product or service speak its true nature. Through image based push notifications they can give their product the right exposure and lure the customer right through the notification. 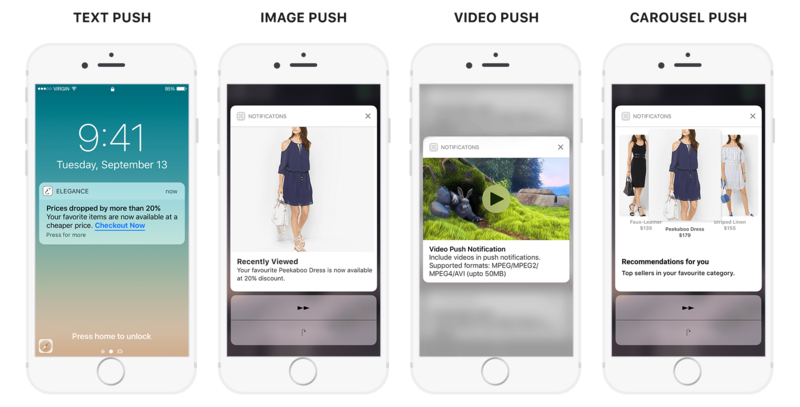 With Gamooga, marketers can create the next level of image-based push notifications by turning them into Carousel Push Notifications. Carousel push allows the marketer to add more than one product or image to the notification along with clear call-to-action, making the notification highly conversion-savvy in nature. With improving technology, today it has become possible for marketers to create push notifications with video embedded in them. It is a great way to communicate much more with almost no dependency on text and thus no word-limit holding back a great communication. Removing the need for the user to enter the App to see the video, such pushes provide the ease of playing the video inside the push thus saving the time of the user and shortening conversion cycle. Pushes can be very different in nature. While few need to be communicated in an urgent manner and just once, others might be required to reach the customer in future and not just once but in repeated intervals. Recurring or scheduled push notifications provide this option to marketers where they can schedule a notification that is needed to be sent in near future or continuously on a recurring day/date/time. Such notifications are useful to convey notifications like Friday sale, Festive sale, or an offer that might be active during some particular time of the day. Once scheduled, marketers can forget about it and shift their focus to analyzing rather than just creating campaigns. Targeting a customer based on their location has its own advantages. It can help businesses target consumers within their geographic premises and offer them their services or product while they are passing by a store or establishment. It is the perfect way to catch the attention of users that might benefit from your product or service as the messaging is highly personalized as thus also comes with high chances of conversion. This is done through a virtual parameter that an App sets for various geographical locations. One of the most effective types of push notification is a segmented push. Designed specifically keeping in mind the relation between relevance and conversion, these notifications rule out the trend of standard messaging. Today, where personalization plays such a significant role in marketing, not customizing messaging as per targeted segments is an opportunity lost in itself. Segmented pushes allow the marketers to target very specific customers instead of all the App users and thus the chances of conversions also increase. For example; if the communication is about kids’ apparels, it would make more sense to send the communication to people who have kids rather than everyone. Gamooga not only offers advanced push notification styles but also an easy and hassle-free process of creating one in a personalized and segmented manner. Here is how you can create a push notification with Gamooga’s marketing automation platform. Bring latent or less engaged users back into your app with powerful push messaging by running triggered push notifications based on the lifecycle events of the user or schedule batch push campaigns. Tailor the push message as per the right audience group, and encourage them to visit your App. Create segments based on any custom user behavior or profile data or predictive intelligence or combine multiple parameters. Here, demography, geo-targeting and event-based segments help create meaningful user buckets. Engage with your users on a personal level. Address them by their names, include offers on their favorite products and give out unique coupon codes. Use your product feed to deliver personalized recommendations. Show Bestsellers, Similar Products, etc. With a simple Push Notification, deliver the same personalized experience to the user that he had while browsing your App. Now that you are sorted with the type of Push Notification that is most suitable for your business and the hassle-free way of creating it with Gamooga, here are some of the BEST PRACTICES of push notification marketing that will make it deliver results. Building a strong friendship is about going from being formal with each other to reachfirst-name-basis. Similarly, you can make a friendly bond with your customers by going first name basis with them. This will make the user comfortable and more connected with the brand. Touch the next level of personalization by including customer’s location, recent purchase pattern or current weather in the messaging to keep the conversation more engaging and real-time. Personally, I would be amused (if not annoyed) if I received a notification about a discount on pet food and accessories, but only because I have no pets. Every individual is unique and they need to be reached out to, relevantly. 1:1 personalization is the key to superlative customer experience and subsequently, a higher conversion rate. Would you like to receive notifications for “today’s lunch offer” at 5pm? It is important to consider user time zones and schedule a timely push, rather than a random push across different time zones. A notification sent at the wrong time, especially during the busiest hours or sleeping hours of the customers might end up annoying the customer, resulting in app uninstallation and possibly loss of a customer. Ill-timed push notifications are not a good experience for your subscribers, leading to fewer clicks and higher opt-out rates. For example: If Netflix was to promote their new hit series to a working professional, doing it during day hours might not work as well as it might at around 6-7 pm. As this particular customer might not stream the series in the day, so a notification seen in the day could easily be ignored or forgotten by the end of the day. Doing it in the evening will keep the messaging fresh and has better chances of conversion. Any marketing strategy no matter how strong it it is bound to fail after a certain point if it doesn’t adhere to progressive norms. This is where being action-oriented comes in as a feature for push notifications. Even after you have done everything right to catch your customer’s attention, they might not always find the time to open the app and perform the desired action. An action-oriented Push Notification allows you to skip this step and let the customer perform the required action within the notification itself. A quick glance and limited attention, that’s all a user gives to a notification, and with so many businesses trying to catch their attention, every user has one notification piled up on another. Let yours stand out with a precise message that’s to the point and backed by a clear call to action. Do you have an upcoming sale? Does your event’s rock concert have only a few tickets left? It is almost always a sensible idea to build up the excitement with push notifications. Leveraging on positive emotions like excitement and curiosity also helps to engage the users in a better way and get higher in-app conversions from campaigns. For example: Informing a person who might have forgotten something in cart that those items just went up on sale. Emojis are also a great way to keep your content engaging, concise and as well as interactive. Use their color and adorable nature to make your notifications more striking instead of simply stuffing them with words. Remember that intelligent push notifications are extreme value additions to a brand and are also regarded by many as the future of marketing. Once combined with the power of machine learning, they will open up a whole new world of possibilities for customer engagement and collaboration. ‘Text only’ notifications are great, but introducing creative banners along with them can make you standout in the crowd. Ensure that the design conveys the message boldly without appearing cluttered. Being restricted to smaller size, every element of the design has to come up crisp, clear and attractive so as not to overpower the messaging or overwhelm the customer. Since push notifications are so intimate in nature; it’s your chance to communicate something urgent in nature or very specific and useful for the user. A brand can use a lot of other marketing platforms to engage their customers like email marketing, social media, web notifications and so on. But, appearing on their mobile screen on a carefully calculated time slot is in itself a big deal. So, ask yourself here what is that particular communication you want to make through this great opportunity. A Push Notification is only a successful one when it’s offering some value addition to the customer’s day in relevance to their browsing behavior, preferences and information requirement. In short, let their click turn into value for them before it does for you or the result will be a dissatisfied and disconnected user. 25% of users say they opt out if messages are too recurrent. While sending out frequent messages may look rewarding in the short-term since you will notice an overall increase in the numbers; in the long-term, sending push notifications too frequently will prompt an increasing number of subscribers to opt out. Not knowing where to draw the line in optimizing the number of notifications per day/per user, might create more damage than benefits. Remember, quality has an edge over quantity when it comes to push notifications and so make each of them count. One of the best solutions in this scenario would be to set up a frequency cap that will restrict the number of notifications a user receives during a particular time period. Great, now you know how to make your notifications the best in the business. But, wait! Do you really, unless you are analyzing the results. Yes, staying dynamic is the most crucial need of marketing nowadays. And this won’t be possible unless you are continuously monitoring how your push notifications are performing. Analyzing will further help you in creating an ecosystem of data through which you can do smart grouping, smart targeting and decode reactions to personalize the experience further and hit the right nerve. When so many benefits come tagged along with a marketing medium, hassles are not left far behind. Same is the case with Push Notification marketing. Earlier we talked about practices that mobile marketers can follow to make their Push Notification marketing yield best results. But, even after doing everything right, most Push Notification campaigns don’t deliver the expected results. Here are some of the challenges that mobile marketers face in terms of under-performing push notification campaigns. 90% of App users tend to uninstall an App between 3 to 30 days of installing it. For marketers, it’s usually a task to figure out which user has uninstalled the app. In such cases, a Push Notification doesn’t get through and ends up staying undelivered. With Gamooga, marketers have the option to convert their push campaigns into SMS campaigns as soon as the App is predicted as uninstalled. This ensures that a communication that might be able to re-engage the user reaches them one way or the other. Not just this, but with Gamooga marketers can also overcome the issue of undelivered pushed owing to App uninstall with the help of following features. Silent push is a hidden version of a normal push notification that is sent to a user’s mobile device. But, unlike a typical push notification, the purpose of silent push is not to cause an interaction but to silently deliver a set of data to the App. The App acts upon that data and sends information to the marketers. These pushes are majorly used by marketers to alert the App about some new information available. It might be to activate it back-up before a Push Notification is to be sent, particularly where it gets disconnected in the background. It is also helpful to gather information where an App might no longer be present in a user’s device and a Push Notification campaign might have been set for them. While ‘Silent Push’ helps marketers know if the App has already been uninstalled however for marketers to discover if a user is about to uninstall an App and take necessary measures to avoid it from happening, Gamooga has the ‘App Uninstall Predict’ feature. Here are some of the strengths of this feature that helps predict an App uninstall accurately. The App uninstall predict module of Gamooga is powered by various Machine Learning prediction model combinations that allow predicting every App uninstall with a high level of accuracy. The feature also helps marketers know what features of their App might be leading to uninstalls or driving users away like frequency or timing of communication or any particular campaign. By understanding the same they can make necessary product adjustments and avoid it from happening. Gamooga’s Machine Learning model calculates uninstall probability of every App user based on multiple prediction models through available data like last 30-day activities on the App, time spent, response to push notifications/emails/SMS etc. This keeps marketers a step ahead to engage those users on priority. The module also provides thorough insights about factors or attributes that might build up an uninstall scenario for the majority of App users. Marketers can use this information to discover similar users and take actions to reduce App churn rate. This is the most common block level for a Push Notification. It is the operating systems that actually allow various apps to send push notifications to users. In the basic permissions asked by the app, a user might simply deny an app to send notifications at the OS level. Issue – GCM will not invalidate the tokens for such settings. Additionally, it also doesn’t inform the server about the blocked notifications. The result being, no notifications get delivered. A lot of times, users turn on the battery saving mode to make their device’s battery last longer. Few devices’ in battery saving mode make few apps to force stop. This might not be applicable for all the apps, but still, few are subjected to this. In such a case, the OS will fail to recognize the notifications, result being; no Push Notification for the users. Many popular mobile devices in market present such restrictions where a push notification fails to deliver due to their uniquely designed OS. Such devices tend to disconnect all connections in the background while in battery saving mode. This cuts off the chord that connection FCM/GCM server to the device, thus making the push to stay undelivered. A user might stay disconnected from the Internet for a long time due to many reasons. While they and their device is away from the Internet, the device sends data to the cell phone network atan interval of 28 minutes and to Wi-Fi in 15 minutes. In case this data fails to reach the GCM server, Google servers retry to make this connection. When the user’s device stays away from the internet for a longer duration, GCM fails to deliver notification but doesn’t discard them either. This results in either delay in delivery or no-delivery at all. TTL or Time to Live is the duration during which the push notification is supposed to reach a particular device. This is usually in case of time-sensitive pushes where a particular discount, sale or personalized offer is to expire after a specified time or period. In case a notification isn’t delivered within that period and the TTL expires, it automatically fails to deliver. This is a common type of issue in the delivery of pushes. Often is the case where a user has uninstalled an App but the marketers still have the ID active with them. In such a case, when the notification is sent to GCM, it receives it as a valid one but due to App being uninstalled, it is not received by the user’s device. Firewall settings can easily block any notification from coming through a source to that particular device. This is usually seen in work spaces where certain sources are blocked to send a communication to devices. In such a case too, push notification sent to that particular device stays undelivered. While few restrictions are hard to overcome, there are some restrictions that can easily be replaced, resulting in better Push Notification delivery. Gamooga’s PushAmplify is the perfect solution to overcome such restrictions and deliver a rate of beyond 90%. Today the prominent devices in the market like Oppo, Vivo, Xiaomi, Huawei, OnePlus, Redmi, Lenovo, etc. constitute almost 53% of the market share. Such devices have a uniquely designed OS that switchesoff all background connections including FCM in order to optimize the battery usage, thereby cutting off the only cord that makes the notification delivery possible. PushAmplify works independent of GCM/FCM limitations and acts as a fallback in case of failure resulting in successful delivery of push notifications on all mobile devices minus the hassles as it comes with a pre-packaged SDK for fast-track marketing. Here is a use case for one of PushAmplify users that witnessed a rise in numbers within a month of implementing it. Where the push notification delivery was happening only through FCM, the delivery on OnePlus, OPPO, Vivo is very poor. However, there is a huge bump on these devices when the pushes are being sent through PushAmplify. Majorly, these are the devices that do not receive push notifications in their dormant mode. Get in touch with our experts to make your next campaign high on conversion.